This is the raw planning material we built up in preparation. It's more likely to be up-to-date than the tables below, but it won't give you a quick summary of total cost. Mike's 1990 Specialized Hardrock at left, James' 1991 Trek 750 at right. One of the motifs of this trip (besides attempting to stay alive) is to succeed as cheaply as possible. Mike, bike geek that he is, initially had a fair inventory of biking equipment and only picked up around $200 in extra bike hardware. 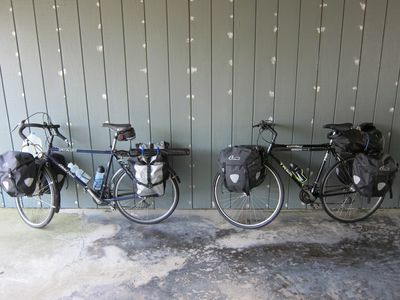 James started at nada and had to scrounge together a bike, "future clothes," panniers, and all the other assorted gear necessary for a slipshod cross-country ride.